What could be better than a family beach vacation in Cancun? I mean, beautiful beaches, lovely surf, sand and sun! Sounds like a paradise to me! If you’re looking for some great insider tips for a Cancun family vacation, check these out! Posted by Kelly who blogs at the CancunCanuck. While traveling with kids remember that safety comes first, do not leave kids unattended in the water – there can be some powerful currents in spots! The sun is very strong this far south so use a waterproof sunscreen and reapply frequently, especially if spending hours in the water. Quick dry surf-shirts are a kid’s best friend. Bring your beach toys or purchase them when you arrive – building elaborate sand castles and burying parents up to their necks in sand is a right of passage on family vacations. For little ones, a life jacket is a good idea, inflatable floaties and tubes provide a sense of security and fun in the water. If you can drag the kids away from the beach, there are a multitude of places where they can still enjoy time in the water. Eco-parks like Xcaret and XelHa are full of surprises and fun for everyone. Snorkel with multi-coloured fish, visit the aquariums, meet some sea turtles and enjoy the flora and fauna of the jungle. Xcaret has an incredible night show that is not to be missed, lights, music and dancing provide an entertaining look at the culture of Mexico. Don’t tell the kids they’re learning something! Snorkeling is an absolute “must do” in the region. The world’s second largest reef runs down the coast and you’ll find a whole new world in places like Cozumel, Isla Mujeres, Puerto Morelos and Akumal. Beginner and advanced snorkelers will love the Yal Ku lagoon in Akumal, a protected inlet with calm, clear waters, chock full of sea life. Swimming with sea turtles is an experience you’ll never forget! See the rest of her post here...there’s LOTS more! -Thanks Kelly!!! As you can see, from those who have been there, these insider tips are really a must have before even considering booking your Cancun family vacation. 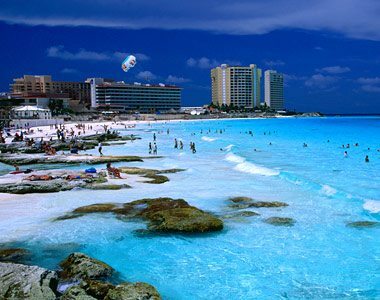 Also check out our posts on a Cancun Family Beach Vacation, Cancun Family Vacation Activities, and More Family Friendly Activities near Cancun. The Hotel is Enhanced Through Its Architecture Inspired by Mayan Culture…. 5 Spectacular Pyramids Extend Between the Beach, the Stunning Landscape and the Exclusive Golf Course. The Hotel Has a Total of 700 Rooms of Which 629 Are Doubles or Singles, 50 Are Junior Suites and 3 Are Suites. Guests Can Also Make Use of the Room and Laundry Services, Babysitting Service, 24-Hour Medical Assistance, Car Rental and Taxi Service, As Well As the Car Park and Garage. Younger Guests May Let Off Steam in the Playground. Excellent challenges entirely, you recently attained a fresh reader. Just what may possibly anyone advocate in terms of your own put up which you produced at times earlier? Almost any favourable?